Well the strawberry bandit has been identified. While I built a cover that would safely keep the birds away from the strawberries I neglected to think about the chipmunks. As I was walking up to the barn guess who ran out of the garden, across my path with a big juicy strawberry in its mouth? Yes, one of the resident chipmunks. As I told The Skipper, chipmunks have to eat too. In the meanwhile, my health insurance company denied the PET scan procedure, but will approve a bone scan followed by a CAT scan. Why do I pay for insurance if when I need it its not available? Also, what is the thinking behind having me ingest radioactive material twice when part of what is damaging my platelets is radiation. Wouldn’t just once be better than twice? After arguing with the insurance company I sat down and thought I’d have a few quiet moments of knitting. I hadn’t even found my place on the lace chart when I heard CRACK BOOM and all the electricity went off. It’s been windy and very dry here. I put the knitting down (mistake number one), walked down the hill to the road and saw that a rather large section of a tree had taken down the wires which were sparking and causing small grass fires. The electrical pole with the transformer on it was leaning and about ready to fall. So I called the fire department and the electrical company in that order. The fire department responded. The electrical company, not so much. There is bad blood between me and the electrical company that goes back years. I am looking at you Consolidated Edison in all your ineptitude. The first thing Con Ed wanted to know is whether I had on hand or could reach an electrician. I told them it was beyond what an electrician could do. It was their pole, their lines, their transformer. Their job to fix it. Two hours later a supervisor from Consolidated Edison shows up. All he is capable of doing is looking at the mess. I wasn’t planning on having to run the generator, so it took some time for me to dig it out of the garage, set it up and then run around looking for gas. Once I finally got it going, I went into the house to return to my knitting. The lace chart was there, but the knitting on the circular needles and the ball of yarn were gone. So perfectly gone were they that I started to doubt whether I had really sat down with it in my hands. I checked the Yarn Rascal proof case I would normally keep it in when not knitting on it, but it wasn’t there. In fact, not only was the knitting missing, but Yarn Rascal appeared to be nowhere in sight. Yes, one and two make three. Yarn Rascal, the lace weight yarn, and the lace knitting were somewhere in the house together alone. I called his name. No response. I finally found him in the back bedroom with the knitting. The ball of lace weight yarn was nearly completely unwound and scattered in small tangled messes around the room. The knitting was on the bed. Half was off the needles. Yarn Rascal himself was on the bead preparing to chew on the cord of the circular needle. His tail was happily wagging and he was squiggling all over with joy. Of course this was all my fault for not securing it away. By the time I finished untangling the yarn and ripping back the lace to the lifeline it was time for bed. The lights had just come on and I was glad to call it day. At 2 am I wake to the sound of loud fireworks being shot off just down the road. I got up, walked down the road in the pitch dark ready to smack whoever was messing around at this hour. As I was walking, I kept noticing that these “fireworks” were sending out a lot of bright white sparks before exploding. I figured it was a new type of firework. At the end of the road I stopped. The other electrical transformer that sits on the other side of our road was the cause of the fireworks. It was blowing up and in doing so, set the wooden electrical pole on fire. I called the fire department and for the second time in ten hours I called our beloved electrical company. I didn’t wait for Con Edison to show up. I left the scene in the capable hands of the fire department. The road back to the house is all up hill. Half way back and there is the coyote. I have no protection with me. We’ve had a rash of coyote attacks on people and dogs. Honestly, I have to say I was in no mood for anything. He must have sensed that. He knew I was teetering on the side of lunacy, because he moved out of my way with his head down and didn’t bother me. What a smart animal. The word for the day is thrombocytopenia. It means low platelet counts in the blood and I have it. How did I get it? From my breast cancer and its treatments. Most specifically from the radiation treatment, which keeps on giving long after treatment is stopped, and my cancer medication. Am I contagious? No. Am I exhausted out of my tiny mind? Yes. It seems that all my complaining about feeling like the marrow is being painfully sucked out of my bones was pretty right on the mark. Platelets depend on bone marrow. Radiation and my cancer medication does nothing beneficial for bone marrow. Speaking of radiation, I have two more medical tests I need to take this year, both of which requires radiation injected into my system. I am, at the moment, one pissed-off camper. There is no easy fix for thrombocytopenia. It is not like I can turn to a vitamin supplement or up my intake of spinach and kale to alleviate it. Nor can I change cancer medications. The one I have is the only thing standing between me more cancer. Despite all this, knitting, yarn hoarding, and chasing Yarn Rascal after he once more breaches the yarn vault are all taking place. At the moment I am knitting this shawl for my sister-in-law who has been living with cancer for over 7 years now. 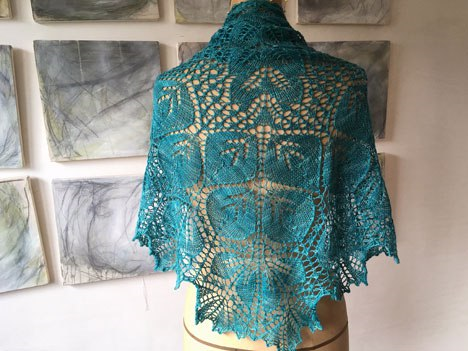 It is the Pothos Shawl by Anne Hanson. I really love her patterns. They are sane, well-written, and a joy to knit. Because it is lace work, it fits into The Art of Masochistic Knitting perfectly. Whether the pattern is written out or charted, no matter how many stitch markers, and despite the use of life lines, knitting anything lacey is masochistic at heart. It will be the subject of my next post. For now, Yarn Rascal has delightedly scampered by with one of my thin, delicate lace weight skeins in his mouth, which is definitely trouble. The Skipper is fussing about something that ate all the strawberries in the garden, and if I am not mistaken our new local coyote is under the apple tree right where I don’t want him. Last year it was the heron, this year seems to be the coyote. Never a dull moment. I didn’t realize how long it’s been since my last post until I looked. Where have I been? Basically processing that bad things can come in large quantities and the shadow of cancer, once you’ve had it, doesn’t go away. The month of May was unbelievable stressful. I had my mammogram, sonogram and MRI scheduled all in that month. Having had breast cancer and a mastectomy I get more than a little anxious during these tests and I just hate the MRI with my whole being. I don’t like having radioactive material injected into my body each year for the MRI. But this go round was and still is a little more stressful. The friend who had breast cancer at the same time I did was also going through her battery of tests. We had thought that together we would beat this cancer thing. Long story short, after an array of tests beyond just the ones for breast cancer my friend has cancer in her lungs and stomach. At the time she was getting her diagnosis something went very wrong with my right hip. The pain in the hip bones was quite bad and I could find no relief whether I sat, stood, or laid down. At the same time, my right hand was going numb and becoming fairly useless. When it wasn’t numb it was painful. At first my GP prescribed a opiode. It did little for the pain, but did make my head foggy enough that doing much more than sitting and staring at the walls was out of the question. Needless to say, I got rid of that medication. He then put me on a rhumetoid arthritis medication and ordered x rays to see if I had developed bone cancer. Along with all the breast imaging tests it seemed like I was always in the hospital getting tested. My oncologist stepped in and was also concerned about the severity of my bone pain as it exceeded the level of bone pain that is caused by my cancer medication and that I live with day to day. The x rays came back negative. I don’t even have arthritis. So what is causing the pain? I am now scheduling a PET scan. This is another test where they inject radioactive material into the body. It is also a highly sensitive test that will show any cancer, no matter how small, that may be in my body. It is also the test my friend had that diagnosed her lung and stomach cancers. I am a nervous, unhappy camper. To make matters just a little more absurd, I am constantly fighting with my insurance company to get them to cover these tests…tests I’d really rather not be going through. By the end of today, Monday at the latest I hope to get the PET scan cleared by my insurance company. My cancer navigator and my oncologist both tell me I need to let go of my friend’s diagnosis. Getting the PET scan does not mean I am going down the same road. I am still afraid. In the meanwhile knitting has been taking place, but at a much slower pace. I’ve designed and knitted up another baby sweater and bonnet. I just need to find time to get the ribbons to finish it off. I’ve also been knitting shawls that have very involved lace work. Anything that taxes my mind and which requires my full attention and concentration I am knitting. It prevents me from running over and over in my mind my friend’s situation and my tests. So that’s where I’ve been and where I am at at the moment.